Groovy tunes, hip playlists and a wonderfully synergetic environment is the music culture at Justinmind thanks to Spotify’s collaborative music playlists! With the onset of open working environments and the rise of digital audio distribution platforms, music has officially entered the workforce! Here at Justinmind, music plays an important role in our team, so much so that we even have our own JIM Spotify collaborative playlist, which all members of the team keep updated with our favorite groovy tunes. Read on to find out about the fun we’ve been having with Spotify and prototyping to the rhythm! The term ‘Crowdsourcing’ is defined as the process of obtaining needed services, ideas, or content by seeking contributions from a large group of people, or a crowd, especially from an online community, rather than from more traditional suppliers. When it comes to music, the idea of crowdsourcing audio playlists is not so new. iTunes DJ has been around for a few years, and a handful of other apps have been tweaked to help make party playlists more collaborative. And for the artist-fan relationship, what better way for a new artist to engage with their fans than by directly collaborating with them? A few years ago, this would have been pretty tough, but today collaborative music projects are going full steam ahead thanks to the efforts of social media and the wonders of the web. There have been some really awesome crowdsourcing ideas emerging of late: from artists asking fans to record themselves singing along to their favorite songs or sending in short video clips for their music videos, to virtual choirs. We’ve also been seeing crowdsourcing music production. A great example is artists streaming from the studio directly to fans, via online audio distribution platforms like Soundcloud. But surprisingly, we’ve only recently been seeing apps make the recording of an audio track a more seamless experience. With cloud tools like Soundtrap, anyone and everyone involved in a music project can contribute their suggestions online with pretty much any device with web browser connectivity. We think that recommendations from supporters via crowdsourcing is a terrific use of the web and social media, and it’s definitely a more personal method. We’re now able to access music and artists all over the world from wherever we are—it’s a revelation! Just think of the opportunities this offers talented musicians worldwide. But that’s not all. Collaborative playlists through digital music services have become a big thing too, and for curating music and encouraging music sharing among friends, family and colleagues, Spotify is an awesome tool. Here at Justinmind, we’re always on the lookout for innovation and new paths, and we apply this way of thinking to our day to day work. We’ve already shown you how we created our very own sprint methodology, which helps us to make production more open, creative and fun-loving! Well, we’re innovating with music in the office. Music is personal and we’re all hard-wired differently. What works for some of us might not work for others, and this is certainly the case with us. We’re an eclectic bunch, with a lot of different personalities. Having said that, there are a few similarities—one of those being our love for music! A few months ago, we had this idea of sharing our music preferences in order to create an awesome fusion of musical wonder, as well as to get to know each other a little better. So, we decided to explore the world of collaborative Spotify playlists. Now we’re not only able to share our styles, we can now easily give recommendations and inspire each other with the many different styles within the team! But it’s not just a case of adding songs to a mutual playlist. Oh no. It’s much, much more than that…you know, we’re creative minds! We hold a weekly Spotify song election to find out what we all think of the week’s picks. There are rules and everything! Check them out and, if you like the idea, why not join in! The winner from the previous week picks a new ‘theme’ for the week commencing. Each member of the team must add 1 song related to this theme and then up to two more, of their choice. For instance, last week was Susana’s birthday and she picked the theme of ‘Birthdays’. Past themes have included funeral music, songs related to colors and songs with cursing (within reason!). At the end of the week, each participant must vote for their favorite and least favorite songs, as well as their favorite ‘theme’ song. The 2 songs with the most positive points will be kept in the playlist. The week’s winner is the participant with the most positive points from that week and they will receive a ‘get out of jail free’ card, which eliminates them from a negative ‘mix bag’ of punishments for that week. 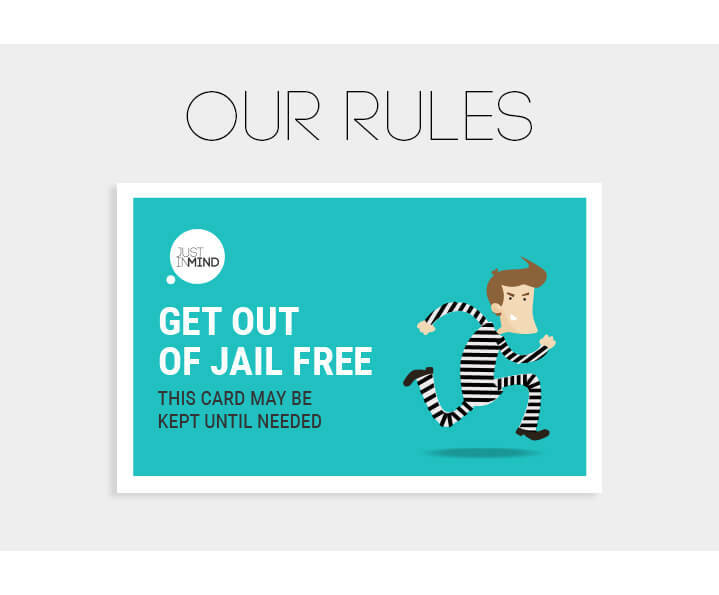 The ‘get out of jail free’ card can be used to get out of completing a punishment. In this case, no one will complete the punishment in that given week. However, only one ‘get out of jail free’ card is allowed per participant at one time. So what happens to the ‘losers’? Well, we strongly believe that there are no negative music tastes, but just less ‘shared’ tastes! So, the names of participant who receives a negative point for their song will automatically be entered in to the ‘loser’s raffle’ and be in the running to have to complete a punishment. The winner will choose a name at random from the raffle. The participant picked from the raffle will choose a punishment from the ‘mix bag’ and they must complete the punishment. Any participant can suggest a punishment, but each must be agreed upon by the majority of participants before being entered in the ‘mix bag’. The next week commences with the winner from the previous picking the new theme. So how do this all of this improve productivity? Let’s face it, we’re obsessed with music—I mean you’re probably listening to music through your headphones right now. Biologically, we’re programmed to love it. In fact, a recent study has shown that our brains actually respond differently to happy and sad music. Whether we’re vibing to Daft Punk or paying aural homage to the genius of Mozart: all kinds of music have an effect on us. In a world of fast-developing music styles and technological advances that bring a maelstrom of new bands and artists to our ears, our tastes are constantly changing. At work, whether you’re in a funk or having a creative block, music can change your mood. .
Like most modern day workers, we constantly have our attention stretched to the max. Listening to music can train the brain to sustain attention and anticipate events, thus making music useful for more than just leisure or casual entertainment. In today’s society of permanent fast-forward mode, playing music can help people cope with a crazy-fast-paced day or long hours at work without losing attention or sacrificing comprehension. When we listen to music using headphones at work, it can block out distracting noises and interruptions, and this is an increasingly helpful attribute now with more working in open environments, sideline conversations, multiple squads etc. Work hard, play hard is our motto! By now you’re probably wondering what the punishments are, right? Well, we’re not that awful! 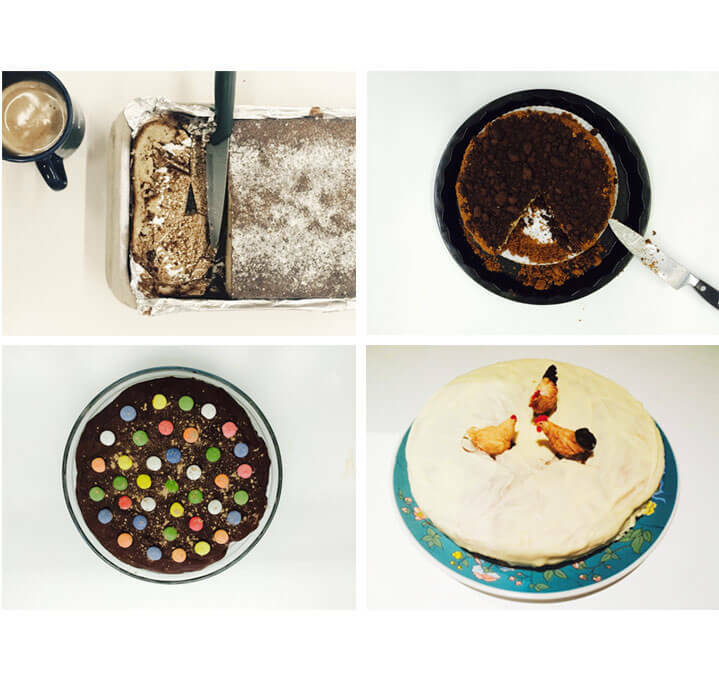 Past punishments have included baking a cake for the whole team, as you can see in the photos below, or spending the day in fluffy slippers around the office. Above all, our collaborative music Playlist brings us closer together as a team, and allows us to get to know one another on a more personal level. So this week, we thought we’d share our team playlist with you guys! Check out our favorite picks that we love listening to at work. We update the list every week and you can also follow us on twitter to get the playlist updates @just_in_mind (#JustinmindSpotify) After all, the more the merrier! So what’s next Spotify? We’d like to see playlists that can be auto-generated depending on what you’re up to – pumping house beats, syncing with our Friday feelings, or even ethereal energy for late-night work sessions. You name it, we want it!